Annabel Anderson has won the first gold medal of the 2017 ISA Worlds in Denmark, putting on a vintage display to break away from a large, elite field in this morning’s 18km marathon event and earn 1000 valuable points for Team New Zealand. 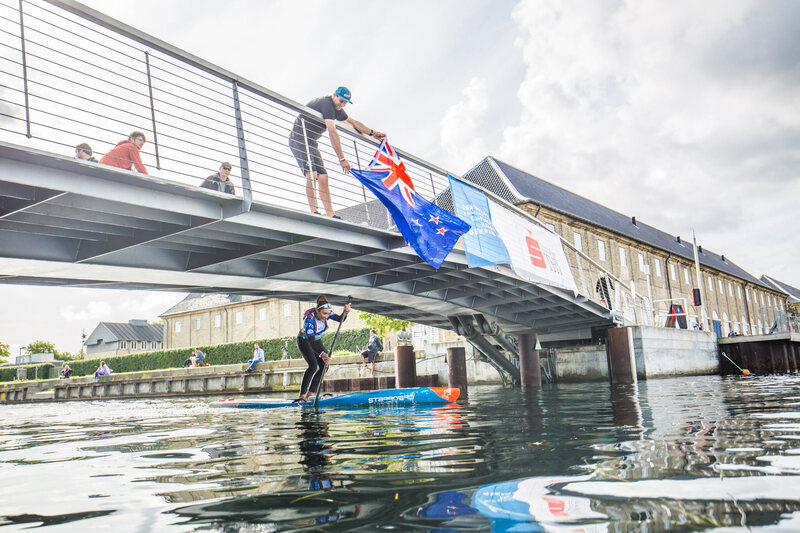 The world number one, who had to borrow a Starboard after her custom Brian Szymanski board was lost in transit, sat with the front pack on the first of four laps around this long but rather technical course in front of Copenhagen’s famous opera house. But as the field started to whittle on the second lap, Annabel put her foot down and broke away, paddling clear to win by two minutes in a time of just over two hours. With the Kiwi setting a lone pace out front, the real race quickly became the battle for the silver medal, with Starboard team mates Sonni Honscheid (Germany), Olivia Piana (France) and Fiona Wylde (USA) establishing themselves as the strongest contenders after the early draft train of 11 top women began splintering in the second half of the race. Sonni, the powerhouse from Germany who has stood on so many podiums in Europe and around the world over the years, was too strong in the end, making a move and pulling clear with about 1km to go. The result made a mockery of our predictions – which had Sonni down in 5th – and highlights just how competitive the top end of the women’s sport is becoming these days. Behind Sonni, Olivia managed to hold off Fiona in the fight for bronze as four of the world’s top six ranked women lived up to their big-name reputations and swept the top four spots. 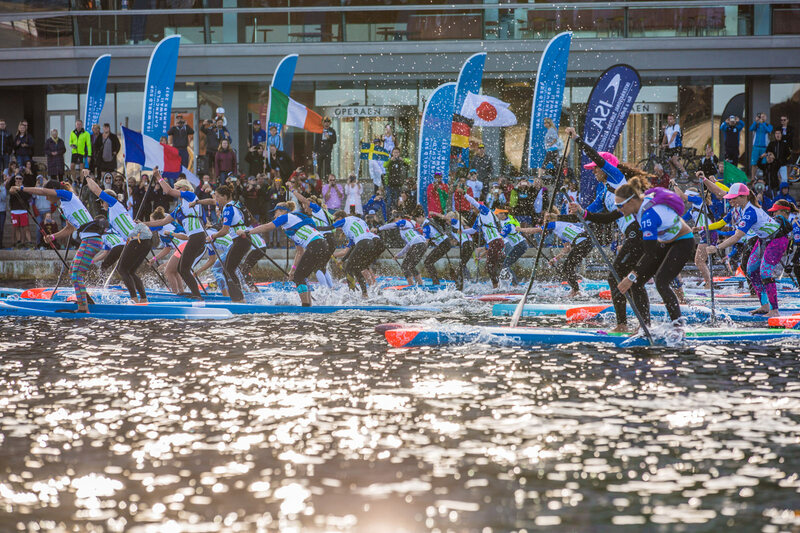 France staked an early claim as favourites for the overall teams title though, with Olivia’s compatriot Amandine Chazot rounding out the top five ahead of Australia’s top-placed finisher in Terrene Black. Led by Olivia and men’s hero Titouan Puyo, France has a supreme all-round squad that will seriously threaten Australia’s stranglehold on the overall teams title this year, and in fact I’m tipping them as the overall teams champion. 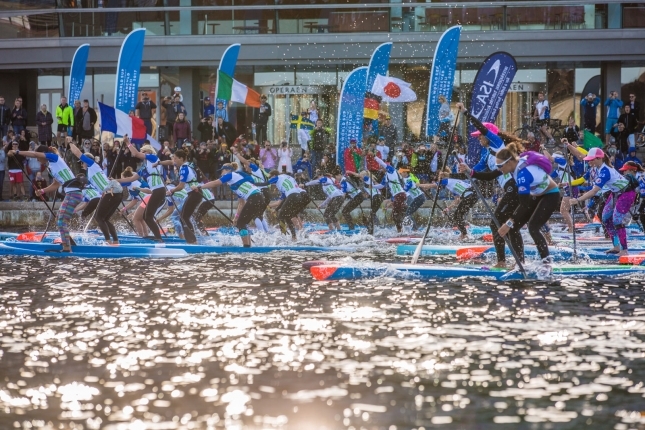 It was great to see over 50 women on the start line of this year’s race, as a record field of 42 nations and the newly-introduced gender equality have made this by far the largest ISA Worlds to date. Other women to impress were the Spanish duo of Laura Quetglas and Susak Molinero, who kept pace with the front-runners early before coming home for a solid 7th/8th place. Behind the Spaniards it was a fantastic performance from young Erika Benitez, who did Team Mexico proud with a great top 10 finish. I spoke with Erika after the race and she told me just how difficult conditions were today — although it was billed as a “flat water” race in reality it was anything but, with tourist boats, which were kept away the protected course but still threw up plenty of wash from afar, as well as refractions from the harbour walls providing plenty of bump and chop to navigate. Erika described it as a “really tough” but also really satisfying day on the water for her personally, with the pocket rocket saving enough energy for the final sprint to the line where she outlasted fellow young gun Manca Notar from Slovenia. Japan’s unheralded Yuka Sato, known more as a surfing specialist, was sitting within the top three early before fading in the second half, however she hung on for a more-than-respectable 11th placed finish, with Australia’s veteran Belinda Stowell-Brett in 12th. You can see the provisional top 10 below; we’ll have full results later this afternoon. 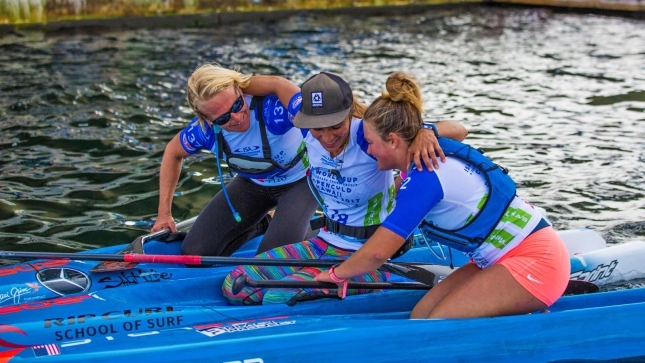 In the traditional prone paddleboard event, Australia’s Jordan Mercer overcame a series of personal and equipment struggles to claim her 9th individual ISA gold medal. The Aussie hero didn’t have it all her own way though, with New Zealand’s Jessica Miller and home nation hero Kathrine Zinck Leth-Espensen pushing her all the way to the line in a tense and exciting finish. France’s Flora Manciet was fourth to give Team France more valuable points on the overall standings. Jordie’s emotional post-race interview – her famous uncle Dean Mercer tragically passed away this week, while her board only arrived in Copenhagen on the eve of the race and was almost broken in two; the Aussies and Brits worked until 2am this morning to get it repaired – summed up the spirit of the event and showed why this young woman is so universally respected both on and off the water.